Bite Club: Say Cheese!...Burger Pizza. Are you fond of celebrity mash up couple names like Brangelina and Kimye? Do you find yourself often in a tizzy when choosing between two foods upon which to indulge? 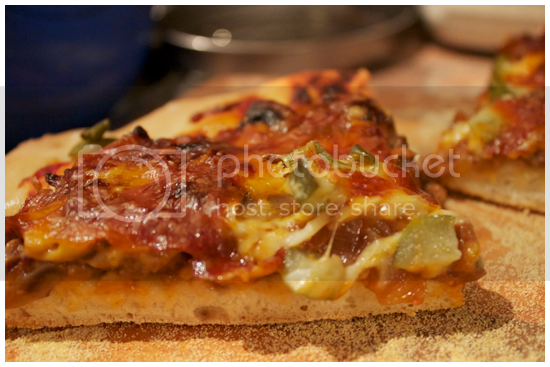 Are you looking for a recipe which will blow your freakin' mind next pizza night? Look no further, friends. In celebration of Bite Club having 30 followers on our Facebook page (WOOHOO! ), I am sharing with you one of my original recipes. I invented this on the advent of my roommate's birthday this year. Her birthday fell on a Tuesday, which is pizza night, the most holy day of the week in our flat. I wanted to make her something awesome that still fell under the religious dietary restrictions of our pizza-for-dinner rule. (Amen.) Well, Rebekah's favourite food is burgers. Any time we go to a restaurant, it's a rare occasion indeed that she doesn't order a burger of some kind. After searching the internet, unsatisfied with pizza recipes that seemed not burger-y enough, or involved hyper processed American cheese, I took matters into my own oven mitts and invented this. Crispy homemade crust, smothered in caramelized onion and mushrooms, ground beef sauteed in burger sauces, and topped off with two kinds of cheeses and pickles. Yes, you read that correctly. Pickles on pizza. Keep the faith. When I made it a second time, for awesome friends Josh and Reb who visited in February, the smell filling the apartment was intoxicating. As we sat around, eating the slices of heaven, even the two of us who had eaten it before would stop between bites and shake our heads in disbelief at the sheer...punch of flavour packed onto this pizza pie. This recipe is insanely good. It has crunch, bite, luxurious ooze, a hint of sweet from the caramelized onions, savoury from the beef and salty tang from the pickles. Not to mention, it's FUN! It's the food that childhood and stoner dreams are made of. Dude, imagine a cheeseburger had a baby with a pizza. DUDE. I MADE IT. Now, you should too. Makes 1 pizza... the pizza of your burger loving dreams. 1. Cut up the onions and add to a large frying pan over medium-low heat with the butter, stirring to make sure they are evenly coated. Cook and stir occasionally to caramelize them, about 45 minutes until golden brown. (Hint: this is a good time to prepare the pizza dough, if you haven't already!) 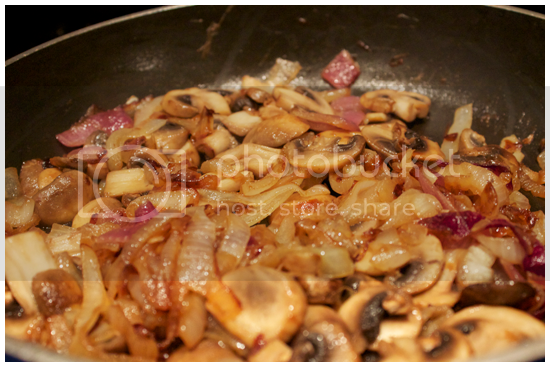 When the onions are golden, add the mushrooms into the same pan and cook until brown. Salt the mixture to taste. 2. Empty the mushrooms and onions into a small bowl and set aside. Put the ground beef into the same pan and crumble it with a wooden spoon. Cook over medium heat until just browned. Turn off the heat and add the mustard and ketchup to the beef, stirring until it is creamy and evenly mixed. Leave to cool. 3. Preheat your oven to 425 degrees. Generously sprinkle a baking sheet with cornmeal, and roll out the dough onto it, all the way to the edges. Grate the cheeses if you haven't already. 4. 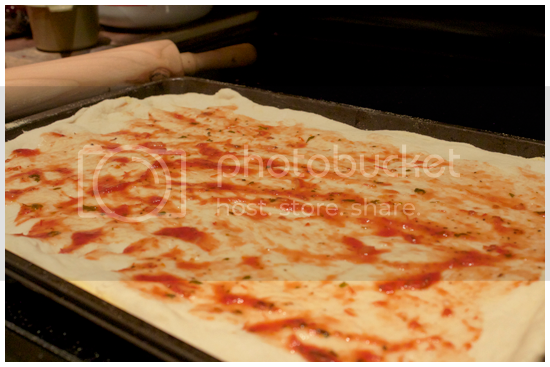 Spread the dough with a thin layer of tomato sauce. 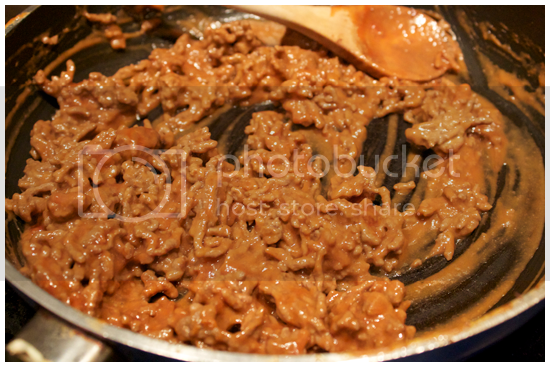 Then, spread the ground beef evenly over the mixture. Follow this with the onions and mushrooms. Cover the entire thing with the grated cheeses. Over the stop, sprinkle the diced pickles. 5. Bake for 30 minutes. When it's finished, remove from the oven and let cool for an additional ten minutes. Slice, serve and live the dream. I Am Jack's Step By Step Photos. 1. Melt butter in a medium frying pan over medium-low heat. 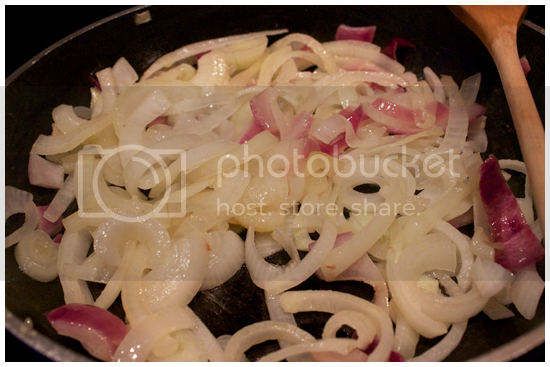 Add the onions, stirring to ensure they are properly coated in butter. 2. After about 35 minutes. The onions will be a golden brown. Add the sliced mushrooms and cook them together, until the mushrooms are browned and slightly shrunken. Empty into a separate bowl, return the pan to the heat. 3. 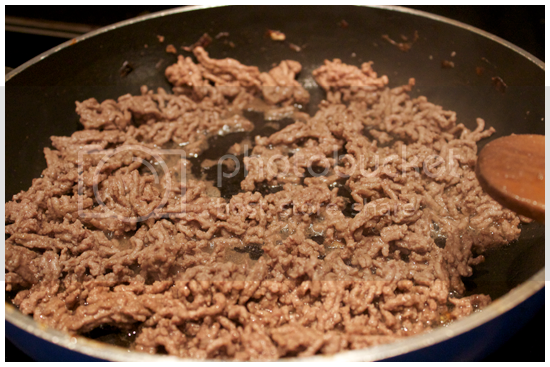 Add the ground beef into the same frying pan, cooking over medium heat until just browned. 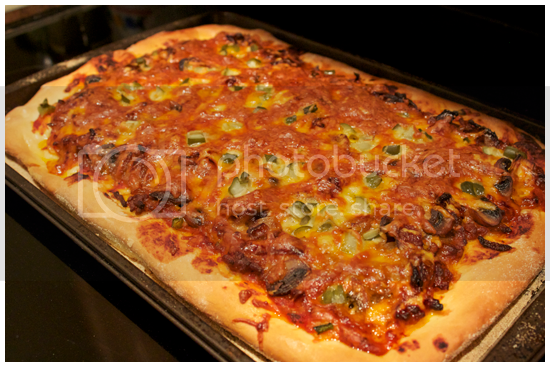 Do not overcook, remember, you'll be baking the pizza for another half an hour! 4. When the beef is cooked, turn off the heat. Stir in the ketchup and the mustard until it is evenly mixed and properly coated. Yes, it looks kind of gross. Is it delicious? ABSOLUTELY. 6. 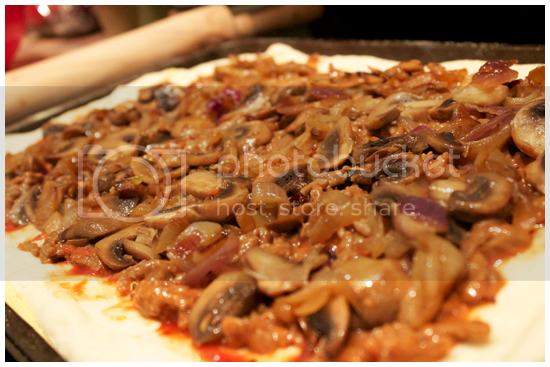 Spread the beef evenly over the dough, followed by the mushrooms and onions. 7. 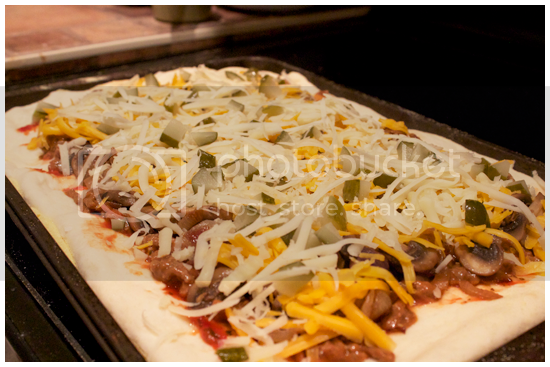 Sprinkle both cheeses over the entire pizza, and top it off with the diced pickles. 8. Bake for 30 minutes, until cheese is melted, and golden brown. 9. Allow the pizza to cool for 10 minutes. 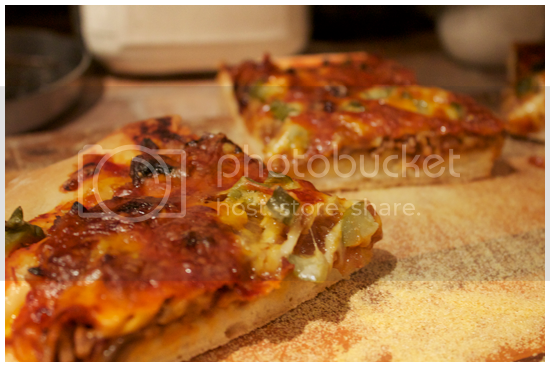 Slide it onto a wooden cutting board, slice and serve!